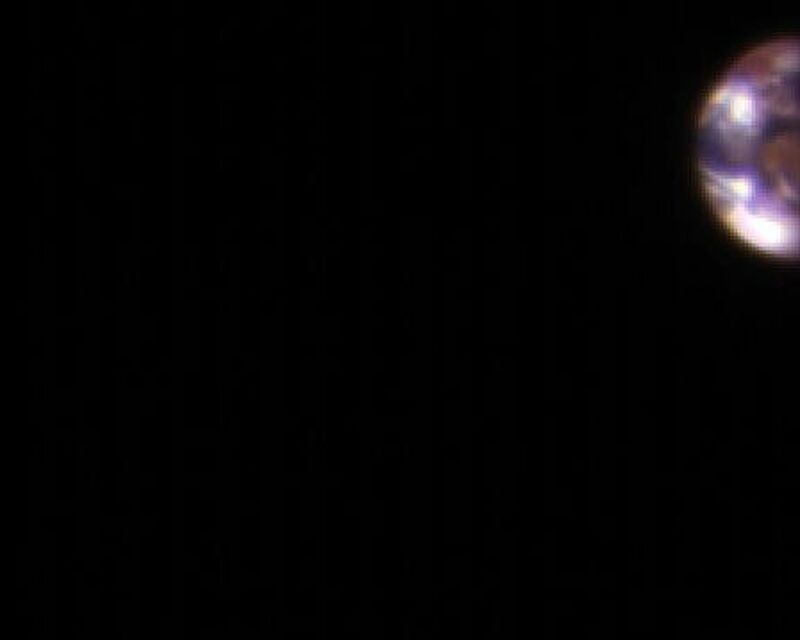 This composite image of Earth and its moon, as seen from Mars, combines the best Earth image with the best moon image from four sets of images acquired on Nov. 20, 2016, by the High Resolution Imaging Science Experiment (HiRISE) camera on NASA's Mars Reconnaissance Orbiter. Each was separately processed prior to combining them so that the moon is bright enough to see. The moon is much darker than Earth and would barely be visible at the same brightness scale as Earth. The combined view retains the correct sizes and positions of the two bodies relative to each other. HiRISE takes images in three wavelength bands: infrared, red, and blue-green. These are displayed here as red, green, and blue, respectively. This is similar to Landsat images in which vegetation appears red. 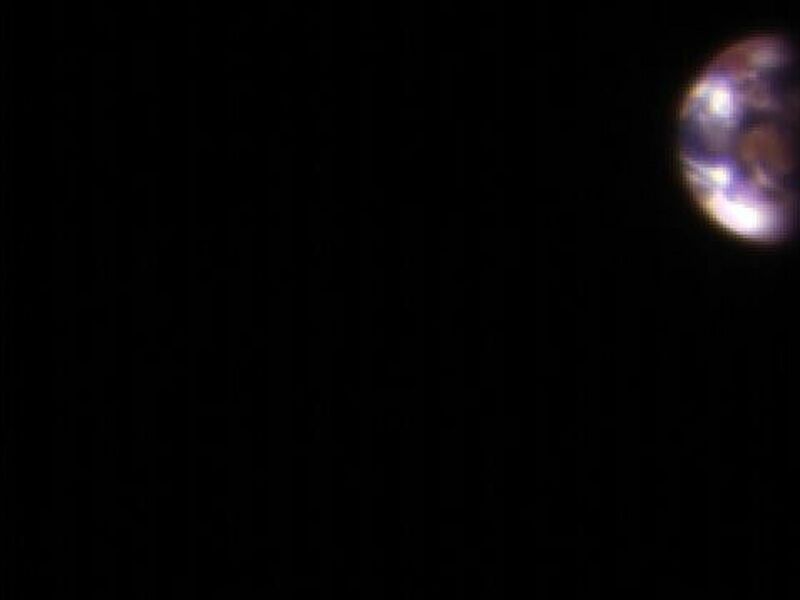 The reddish feature in the middle of the Earth image is Australia. Southeast Asia appears as the reddish area (due to vegetation) near the top; Antarctica is the bright blob at bottom-left. Other bright areas are clouds. These images were acquired for calibration of HiRISE data, since the spectral reflectance of the Moon's near side is very well known. 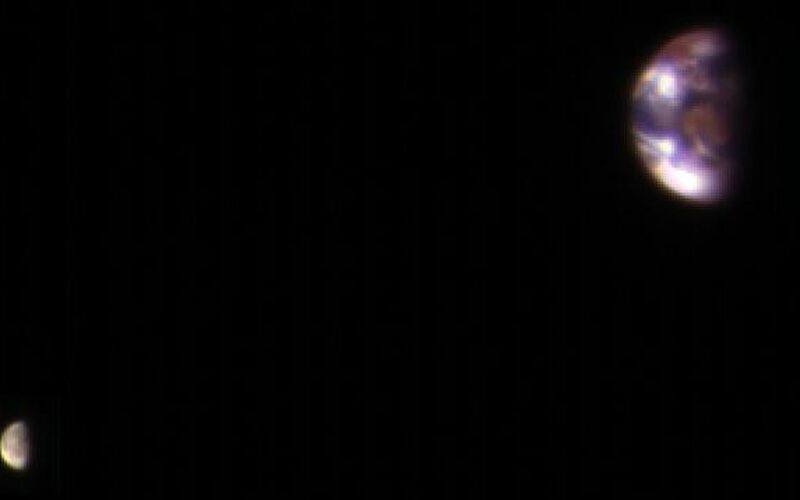 When the component images were taken, Mars was about 127 million miles (205 million kilometers) from Earth. 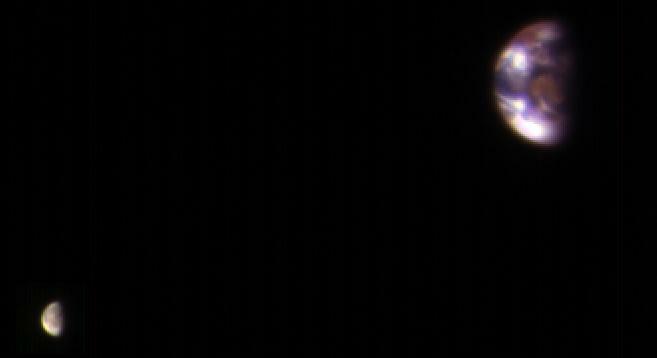 A previous HiRISE image of Earth and the moon is online at PIA10244.